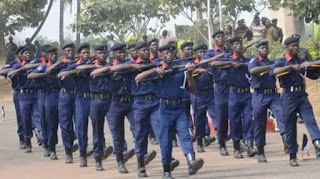 Hello, do you wish to apply for the Nigeria civil defence recruitment? This post was meant to walk you through the steps you need to take in order to successfully apply for NSCDC. There were a lot of rumors flying around that "the Nigerian civil defence recruitment portal is open" but the last time I checked, it wasn't. So, what am I trying to say here? All what I am saying is that "The NSCDC recruitment portal is not online yet" but you can subscribe to this blog's push notification so that you can get notified when ever it is opened for applications. Though the Nigeria civil defence recruitment for this year has not started yet, we decided to teach you how to easily apply for NSCDC when their portal is opened using our knowledge of how it was done in the past years. Before you apply, there are some requirements which you will have to fill. After making sure you have all the requirements, you are good to go and the step by step guide for application is below. The first step is to visit the Nigeria civil defence portal. After visiting, the next thing you need to do is fill the form which you see on the page and then submit your application. If they are recruiting, you will be able to fill a form and if they aren't, the page displays a "No Vacancy" banner right in the middle of the website. Always visit this page to check when this recruitment will start or you can opt-in for our daily updates by refreshing this page and clicking "yes" on the black pop-up that shows up. Beware that there are some scammers out there on social networks and some websites that promise to help you get employed by this para-military organisation. At the end of the day, they will request for money from you and the moment you give them this money, they immediately stop responding to your messages, so be warned. To get the latest NSCDC recruitment news, just keep visiting this blog on a daily basis to get not just news about NSCDC but also other jobs recruitment in Nigeria. Please note that this site provides you solely with the latest news on job vacancies on Nigeria. Do you have any question regarding the Nigeria civil defence recruitment? kindly use the comment box below to ask us and we will reply as fast as possible. Don't forget to share this post with your family and friends by using any of the social icons below.